Another episode in my series where I take a snapshot of my reading life on the first day of each month. It’s a way of keeping track of the year though there is little chance I will forget February 1, 2017. It’s the day I came home from hospital to begin a 12 week program of recovery from liver surgery. The next few months are going to be rather challenging. Either I will throttle my husband because he’s such a bad nurse or he will throttle me because I am a totally impossible patient. Joking aside though, despite the excellent care from the medical and nursing teams at the hospital, it is wonderful to be home and in my own bed. 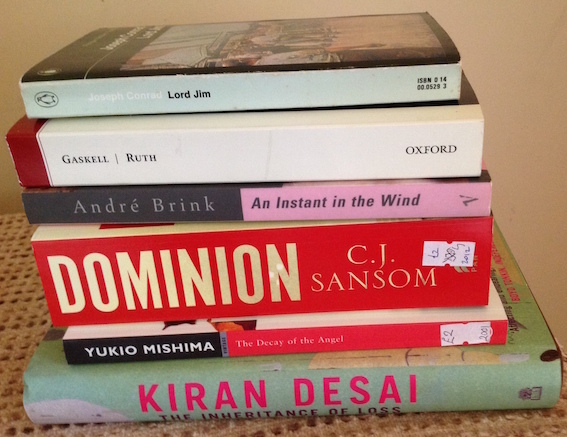 One of the essential tasks for my hospital stay was to select the books I would take with me. Note the plural there. I fully expected to be spending hours unable to do anything other than have my nose in a book so of course needed several options. Since hospital wards are not known for their storage space I constrained myself to two initially – the 600-plus page alternative history thriller Dominion by C. J Sansom and A Time Traveller’s Guide to Medieval England by Ian Mortimer. But I put aside a pile of another 8 books for my husband to bring with him on his daily visits. What was I thinking of??? Hospitals are no more suited to reading than jet aircraft. Just when you’ve recovered enough to even feel like picking up a book there’s always someone with needle/thermometer/ blood pressure monitor in hand clamouring for attention. After seven nights I hadn’t even got half way through Dominion. Ian Mortimer’s re-creation of the smells and sounds of fourteenth century England was despatched home without being opened. One of my goals for 2017 is to enjoy the books I already own and to reign back on acquiring yet more. I started 2017 with 318 unread books ( I thought it was 299 but then discovered my list of ebooks was incorrect) and a plan to hold off from adding to that number for the first six months of the year. I was doing extremely well up until the end of January, finishing six books from my shelves and managing to resist the temptation of a local library sale and daily promotions from booksellers. But then my sister turned up in hospital having bought me three books so now as of Feb I, the personal library stands at 315 – a net improvement of just 3. Of the books I read in January, the stand out was Narcopolis by Jeet Thayli, a Booker prize shortlisted title that was an intense experience. My self imposed restriction on book buying hasn’t stopped me from adding new titles to my Goodreads wishlist. Additions in January included a biography: Charlotte Bronte: a Fiery Heart by Claire Harman; Human Acts by Han Kang (though I have yet to read her earlier novel The Vegetarian) and a Japanese crime thriller The Devotion of Suspect X by Keigo Higashino and a book I keep seeing reviewed in a very positive way: A Gentleman in Moscow by Amor Towles. Sovereign is the third title in a series relating the escapades of Matthew Shardlake, a 16th-century lawyer afflicted by a hunched back but blessed with an astute mind. He needs all his wits about him if he is to keep his head on his shoulders amid the dangerous forces of the court of Henry VIII. Plenty of other people have already lost theirs as a result of plotting against the King. Not a pleasant prospect but preferable to the fate meted out to some conspirators who were tortured then hung, drawn and quartered or dangled in chains from the castle ramparts until they died, ever so slowly. It’s the rotting body parts of these failed conspirators that greet Shardlake when he arrives in the city of York. He’s there with his sidekick Barak to make sure one conspirator is kept in good shape until he can be taken to London for an appointment with the king’s skilful torturers. The city is in turmoil as it awaits the arrival of Henry, and his young wife Catherine (wife number five). The King is undertaking a royal progress to bring the rebellious north to heel and impress upon them just who is in charge of the realm. 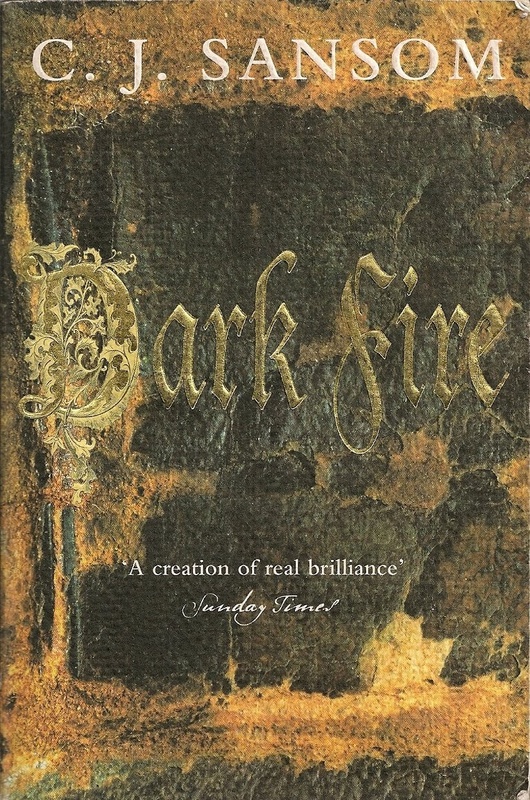 His visit is supposed to quell all possibilities of another insurrection but Shardlake discovered there is another plot afoot among a faction who disputes the King’s claim to the throne. The story involves considerable manoeuvring as Shardlake tries to keep the prisoner safe, discover the identity of a murderer and find out who is behind the conspiracy all the while trying to avoid getting himself killed. It’s all good fun and very readable even if sometimes improbable that a man with Shardlake’s affliction has the physical stamina he is called upon to exert. The real beauty of Sovereign, as with all the others I’ve read in the series, is the level of authenticity C. J Sansom brings to his narrative. This is a warts and all version of Tudor England; a country where northerners view those from the south with deep suspicion and hostility and the great edifices of the Catholic Church are torn down to be recycled as manor houses for those looking to increase their wealth and power base. Sansom gives us fascinating insight into the exhaustive preparations needed to support the King on his travel through the land. It took an army of courtiers, soldiers, cooks, labourers and clerics to get the entourage from A to B and fed, watered and bedded each night. But those problems are as nothing compared to the challenge of dealing with basic bodily needs as one official confides to Shardlake. Far from a regal procession this is the progress of a force that spreads disease in its wake, personified in the figure of the King himself. The year is 1541 and Henry is no longer the upright athletic figure of his youth. Sansom makes us see the huge bulk of a man with “red jowly face, fringe of reddish grey bead, a pursed little mouth under a commanding beak of a nose and small, deep,set eyes.” We hear his voice which humiliates and humbles his subjects. We smell the stench of decaying flesh that oozes from his suppurating ulcerated legs and cringe at the image of him bedding his very young, fragile new bride. The episode in which the crookbacked lawyer comes face to face with the King, is a tremendous set piece in which Sansom’s talent for period detail becomes clear. His Shardlake novels are rigorously researched but it seems none more so than with Sovereign. Sansom was so frustrated by the differences in historians’ accounts of the Royal Progress of 1541 that he wrote his own academic paper on the subject. The product of this is an episode which reflects the theatricalities of which Henry was enamoured as well as the mercurial side of his character. This is a novel in which its easy to lose yourself in the world of sixteenth century politics and life. Just be glad that you can easily escape the reality of the smells, the basic bathroom facilities and the dangers to your head simply by closing the book. Sovereign is published in the UK by Pan. Another storm was predicted to hit the UK today and tomorrow which is not good news at any time but esp ecially disconcerting when you have to get to the airport. Hope the Met Office gets the forecast wrong… Talking of the Met Office it seems ever since they embarked on their “name the storm” project last autumn, we seem to have had them more frequently. We started with Abigail, now we’re up to Henry. At this rate we’ll have exhausted the alphabet before year end. I just managed to finish Look at Me by Jennifer Egan on my last night at home for a few weeks. I started reading this in November but put it on the back burner so I could attend to a few other commitments but I was determined not to let it run into a third month. I wasn’t sure I would take to it but it grew on me the more I saw how richly layered it was in its treatment of the theme of identity. 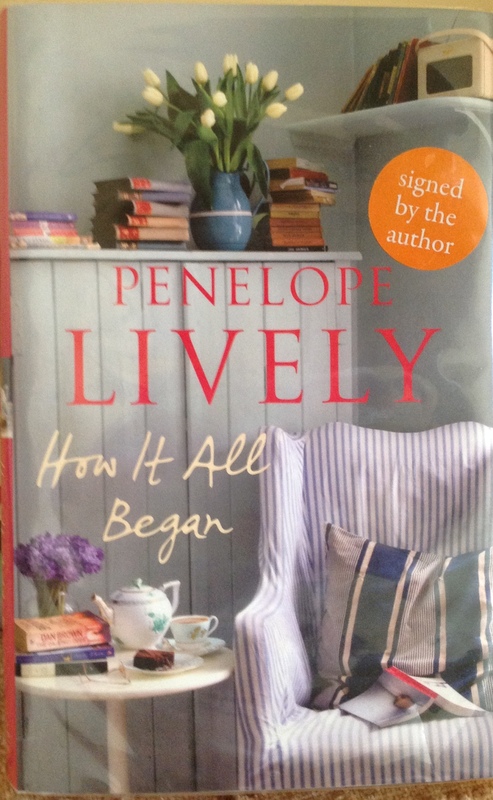 So here I am on the first of the month with a new book to open. And I can’t decide which it will be. I have with me Sovereign by C.J Sansom which is the third in his series about the lawyer turned detective Matthew Shardlake who has to navigate the political turmoil of the Tudor era. I also have Winifred Holtby’s most famous work, South Riding, which is a portrait of a Yorkshire community dealing with the effect of the Depression. Both have the advantage of being long enough to sustain me through an eight hour flight. I suspect the decision will be a sour of the moment thing just before my bag goes through check in. Of course if the ultimate choice doesn’t work out I have plenty of Net Galley titles on my e reader including the latest Helen Dunmore novel Exposure. I wasn’t impressed with the on,y other title I read by her, The Great Coat, but since that wasnt the genre she normally inhabits I thoughts she deserved another try. On my car journey up to the airport I listened to the final chapters of The Vanishing Point by Val McDermid. It’s not one that features any of her detective creations but is a stand alone thriller about the abud toon of a child from an airport while in the care of his adopted mother Stephanie Harker. She is a ghost writer who compiles the autographies of celebrities. Her relationship with the boys real mother Scarlett Higgins, a foul-mouthed reality TV star known to the nation as the Scarlett Harlot, began on a professional level but soon lurched towards the personal. To discover who addicted the boy, Harker has to delve into the past. This is the first time I’ve experienced fed Val McDermid which is odd given how prolific and highly respected she is. I suspect this is not one of her best, though it was good enough to get me through the drive even if I did find the actress playing Harker had that very irritating habit of the upward inflection at the end of every sentence. The hotel tv channels didn’t offer too much in the way of entertainment tonight – practically every channel had a tribute to Terry Wogan and all more or less said the same thing. The best option was a dramatisation of the relationship between Mary Queen of Scots and Elizabeth 1 told through through the correspondance they maintained for about two decades. It did a pretty fair job of showing the rivalry between these two and how cunning Elizabeth was towards her cousin. 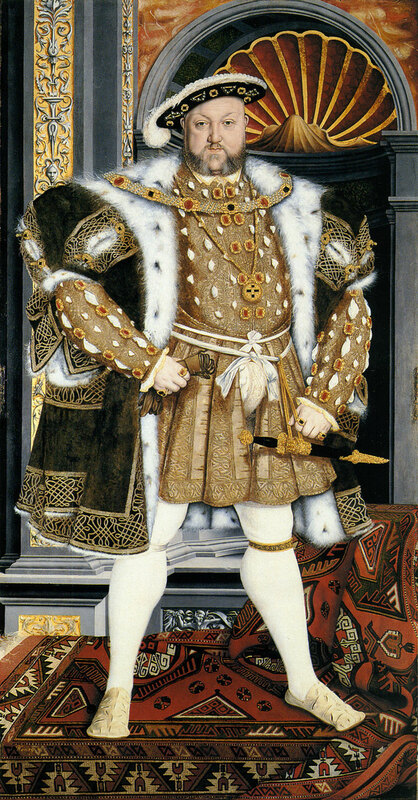 When you see the name of King Henry VIII, what’s the image that comes to your mind? 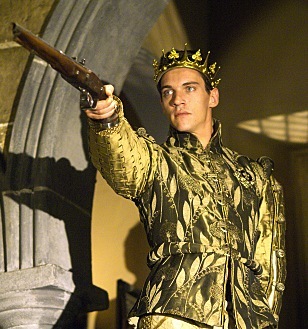 One in which the monarch has the physique and appearance of a model (as portrayed by Jonathan Rhys in the TV series The Tudors)? Or one of an athletic king with steely eyes as played by Damien Lewis in the BBC television adaptation of Hilary Mantel’s Wolf Hall? Or the way that Henry himself wanted to be portrayed; A man of authority who, even when he’s not kitted out in full royal regalia exudes power. One of the most famous of contemporary portraits shows him directly facing the viewer, legs firmly planted apart and arms akimbo to emphasise his powerful physique. The message is clear: don’t even think of messing around with me. In C.J Sansom’s historical series featuring a ‘detective’ lawyer, Shardlake, the man of law has learned over the years to fear his encounters with the King and the powerful men who surround him. Lamentation, the latest episode in the series, sees Shardlake once again become embroiled in the kind of political intrigue that could easily cost him his head. This time it’s the King’s wife Katherine who needs his help when a book of spiritual reflections she has written is stolen from her bedroom. In the religious turmoil of the 1540s, this book could incite even further discord in the land if it is published. Katherine’s own safety as risk. For the King;s own wife to write such a text without his knowledge could be considered as treason. Shardlake has a soft spot for the queen so accepts her plea to find the book before the King discovers what’s happened. What ensues is a romp around London, from its leafy Inns of Court and the splendour of its royal palaces to the seedy streets of the poorer quarters as Shardlake tries to discover who is behind the theft and why. It brings him into personal danger with sword fights and a spell in the dreaded dungeons of The Tower. It’s all very entertaining if somewhat improbable on many occasions —although Shardlake suffers from his physical deformity and often refers to his aching back, the man still seems to have an extraordinary level of stamina, always dashing about on horse or foot for hours. The man I saw now was the very wreck of a human being. His huge legs, made larger still by swathes of bandages, were splayed out like a gigantic child’s as he took each slow and painful step. Every movement sent his immense body wobbling and juddering beneath his caftan. His face was great mess of fat, the little mouth and tiny eyes almost hidden in its folds, the once beaky nose full and fleshy. Later he sees Henry winched up to his stateroom, his immense body and folds of fat strapped into a wheelchair. As shocked as Shardlake is, he knows well that to merely comment on the King’s health let alone reveal the truth, would be treasonable. This is an age where lips must be kept shut if you fear for your life. One unguarded comment could lead to a charge of heresy. The tone is set within the first few pages of the novel where Shardlake is despatched, reluctantly to witness the burning alive of a heretic. There was a smell of smoke around Smithfield now as well as the stink of the crowd and of something else, familiar from the kitchen: the smell of roasting meat. Against my will I looked again at the stakes. The flames had reached higher: the victims lower bodies were blackened, white bone showing through here and there. their upper parts red with blood as the flames licked at them. Shardlake must navigate this atmosphere of fear and contend with the King’s circle of unscrupulous advisers to achieve his mission. By the end he yearns for a quieter life in which he becomes a lawyer in a provincial town far from the corruption of the capital and the machinations of the court. But Shardlake is ever a sucker for the ladies and how can he resist when he is offered a new role, as adviser to the Princess Elizabeth. And thus, very neatly, Sansom sets us up for another chapter in Shardlake’s life and – thankfully – a few more novels to look forward to reading. My reviews of other novels within the series can be found via the links below. How do you judge the size of the knife used to kill the man whose body you’ve just found face down in a haystack? Today’s investigators have an easy task of it with oodles of NCIS-style gizmos at their disposal. But for their twelfth-century predecessors, detection was rather more of a hands-on affair − you simply stuck your thumb in the wound to see how deep you could go. It’s a bit messy clearly and you have to also put up with the rather to the sickening sucking sound made when you pull your thumb out again. This insight— and many others — into life in England under King Richard (aka The Lionheart) is the main appeal of the Crowner John series of books by Bernard Knight. Knight is a qualified barrister and was one of the foremost pathologists in the UK during the 1970s and 80s, the man involved in many of the high profile cases of those decades from and was involved in many high profile cases such as Fred and Rose West, and the child killer, Mary Bell.which means the detection elements of his novels are firmly grounded in reality. One of the locations in the Crowner John series. In Crowner John (the title of Crowner is the origin of the modern day term Coroner), Knight has created a compelling character of Sir John de Wolfe. Wolfe is a former crusader who is now the Keeper of the Pleas of the King’s Crown, based in the city of Exeter with a remit to investigate suspicious deaths and hold inquests. He presents a foreboding figure as he strides through Exeter dressed in his habitual black or grey and with a persistent scowl on his face. He has plenty to scowl about: his wife is fat and ugly and her brother the Sheriff (who is also supposed to keep law and order locally) is not only lazy and greedy, he’s probably corrupt. Little wonder therefore that John seeks solace in the arms of a local inn keeper and in the close companionship of his clerk and his retainer. I’ve read or listened to four of the 15 novels in the series – most recently The Figure of Hate published in 2005 in which Crowner John investigates the murder of a local manor lord and his son. The plot is ok but it’s the window Knight shines on the daily life and practices of the twelfth century that provide the most fascinating for me. This is world in which very few people beyond the clergy could read or write (even Sir John struggles through Latin lessons); where beds were extremely rare and beer was a much safer drink than water. In The Figure of Hate, we get some interesting background on the origin of the jousting tournament, the weaponry and and a good sense of just how fit the jousting men must have been to fight in heavy protective armour astride a fast moving horse. Dont expect any great literary flair in the writing style. That’s not Knight’s forte. In fact he can be overly repetitive with some detail (we get told at least four times in The Figure of Hate that John and his mistress innkeeper whisper their sweet nothings in the Welsh language). The Crowner John series isn’t anywhere as good as C J Sansom’s Shardlake series but they are an entertaining read nevertheless. Dissolution plunges us into the turmoil of a sixteenth-century England whose citizens fear for their lives unless they adhere to the country’s newly proscribed form of faith. Chief Minister Thomas Cromwell is hell bent on ensuring Catholicism is eradicated; dissolving the monasteries, evicting its cloistered inhabitants and selling the land and assets to loyal supporters of his master King Henry VIII. Those who resist and speak out against the new order find themselves imprisoned in the Tower of London and tortured or executed. The murder of a Royal Commissioner while on a mission to root out corruption at a monastery in Kent , threatens to disrupt all of Cromwell’s plans. He needs the perpetrator found quickly and secretly — and he knows just the man to do the job. His choice — Matthew Shardlake, lawyer and long-time supporter of the Reformation. Shardlake and his young relative Mark Poer are despatched to the south coast to investigate the murder. As in all good murder mystery stories, the investigators quickly learn almost everyone has a secret and a motive. Hidden passages; false trails; multiple corpses; near death experiences; fights and escapes: all the standard components of the genre are in this book. What lifts Dissolution well above the usual fare is the quality of Sansom’s writing with its strong sense of place and atmosphere and an intriguing, multi-dimensional protagonist. Sansom perfectly evokes the desolation and isolation of the monastery’s setting on the edge of the Weald with its treacherous currents that only smugglers and a few inhabitants dare cross. The heavy snow which falls as Shardlake arrives at the monastery acts as a metaphoric cloak through which he must penetrate to find the killer. But Shardlake uncovers more than the answer to the crime. What he discovers creates deep unease within himself about Cromwell’s motives and challenges his beliefs about the new future for his country once Reform is fully enacted. By the time the book ends, his faith in humanity is damaged and his idealism has given way to an acute awareness of the corruption all around him. …. there is nowhere safe in the world now, nothing certain. …. The Bible says God made man in his image but I think we make and remake him in whatever happens to suit our shifting needs. I wonder if he knows or cares. All is dissolving. 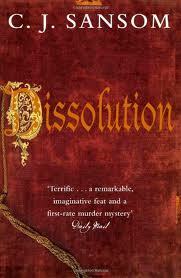 Dissolution is the first in a series of books featuring Shardlake. I will definitely return for more of this intriguing character. The Guardian newspaper has an interesting article in which Sansom talks about his Shardlake series.